With its capacity to detect a user’s movements, the Microsoft Kinect system stands ready to change how the museum and themed entertainment field might consider where an interactive experience occurs and what the interactive medium might be. As shown recently here in our blog over two months ago, water can serve as an interface location. In fact, recently this same story again surfaced across the web – for example here and here. Certainly, the next step is developing more sophisticated augmented reality experiences based on this ability. While the water example shows some rudimentary possibilities, an application (came out last year) that certainly could have potential impacts – educationally and otherwise – is shown here. In this one sand is sand to as our medium and simulate water and water flow. A further refined version is being worked on or is finished through the work Oliver Kreylos of UC, Davis, the Tahoe Environmental Research Center (at UC, Davis), and the Lawrence Hall of Science (at UC, Berkeley) for ECHO Lake Aquarium and Science Center in Burlington, Vermont. Here is video of that piece. Thinking back on past projects where we wanted to create a physical interactive six or seven years ago about watersheds and drainage, had this been around, we might have jumped on it. But this technology, along with things such as our posting two weeks ago on motion tracking systems and cameras/projection, means that as we think about exhibitions, there is a vast opportunity to add an additional digital dimension if necessary. This applies even to some our most tried-and-true interactive examples. Take a gravity well. When we will see the first one where, as the ball travels down the well, the acceleration figures, the projected path, or force vectors are projected on the surface of the gravity well itself? 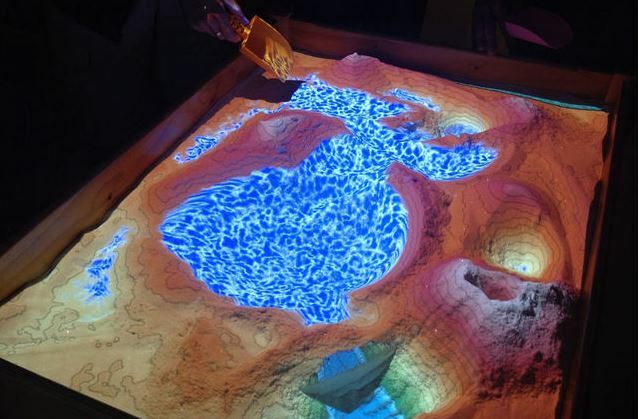 How about projection on an erosion table? The list of possibilities is endless. Additionally, all of this digital information can be saved, taken home, shared on personal devices, and distributed through the cloud. We are just beginning to explore how this could change the ways physical interactives can link together with our lives outside of the walls of a museum. But there are dangers, and at times we don’t want this extra layer. It might detract from the innate beauty, simplicity, or emotional and learning impacts of the physical interactive. The key will be figuring out when to add this ability and when to leave the physical reality of a phenomenon alone. We here at the studio can already imagine the debates and conversations that will erupt as we move forward with these evolving abilities. Those are going to be some good conversations around the conference bar! Meanwhile until then we remain on the lookout for new examples. Do you know of any? What do you think of the coming revolution? As technologies develop, the interaction and interplay between the physical world and the digital world become more enmeshed. Certainly, this is an area of continual development and exploration in exhibition design – in particular in dealing with what has traditionally been 2D graphics. Recently there has been a proliferation of moving away from physically printed panels to providing digital touch panels that take advantage of what the digital medium can provide. 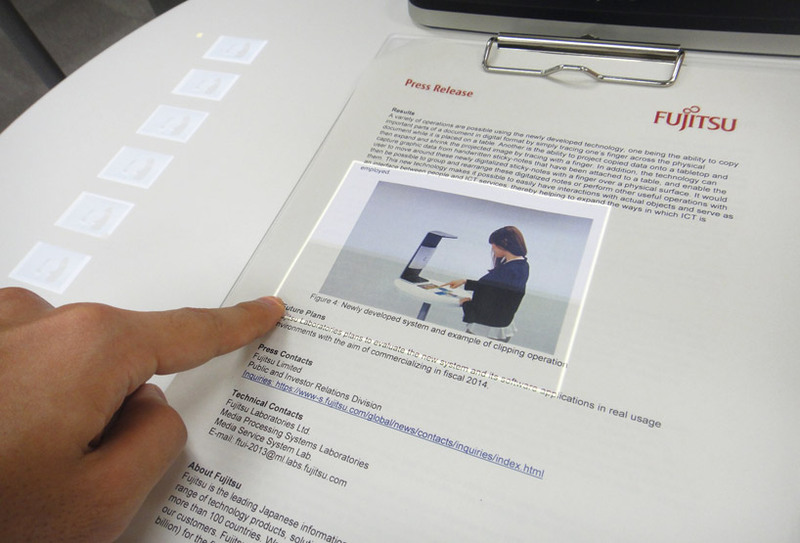 A twist that suggests a different approach, or one that offers interesting differences, is the new system generated by Fujitsu Laboratories , which is an augmented reality user interface. what is nice about this approach is the clarity and simplicity of the interface and the design, as well as the invisibility of the technology with the physical object. 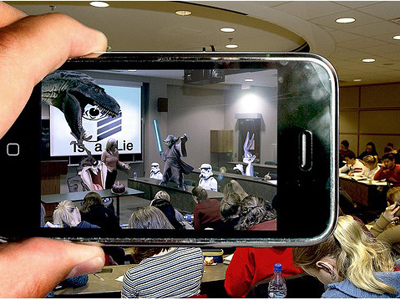 Finally, it also turns around the whole augmented reality approach. Rather than the added information requiring viewing on a digital device, it instead becomes part of the very physical object one is manipulating.